Baldwin Wallace College Student Population: Who Goes Here? 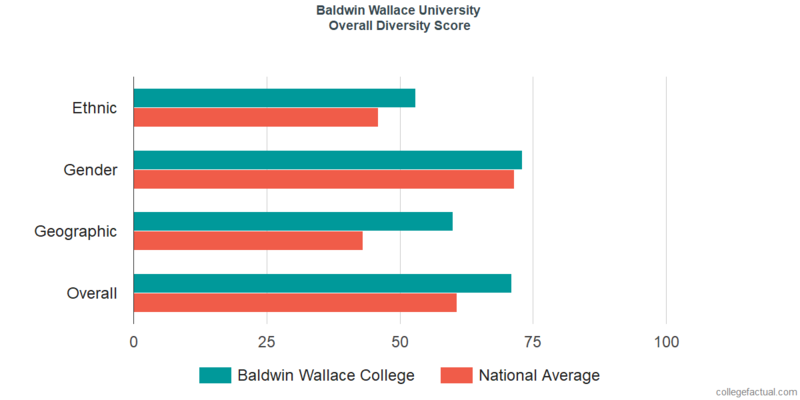 Get the Facts on Diversity at Baldwin Wallace College, Including how This School Compares to Others in the Country. The overall diversity ranking is created by combining the results of ethnic, geographic, age and gender diversity. Considered above average in terms of overall diversity, Baldwin Wallace University is ranked #725 nationwide. Baldwin Wallace University is pretty average when it comes to ethnic diversity, being ranked at #1,562 in the nation. 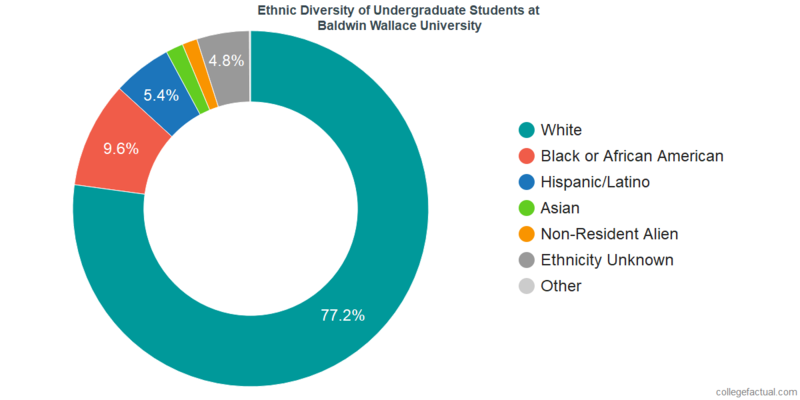 The chart below will display the diversity of undergraduate students at Baldwin Wallace College if it is available. 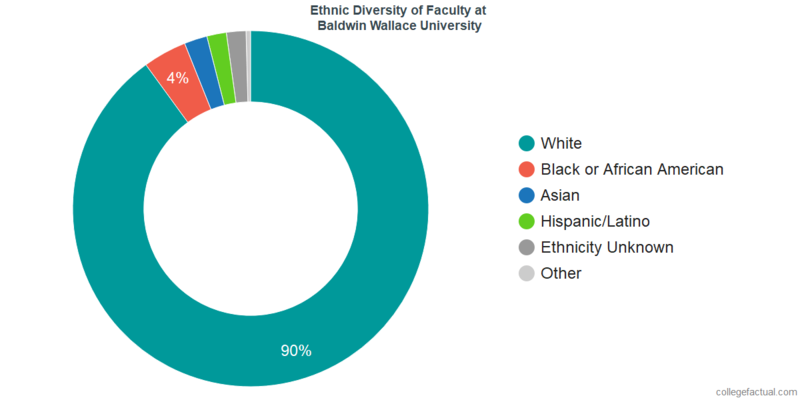 Baldwin Wallace College's ethnic diversity is on par with the national average. Would you prefer a nice mix of males and females on campus? At Baldwin Wallace University, the disparity between men and women on campus is lower than the national average. The undergraduate student body at Baldwin Wallace College is equally balanced. This university is ranked at #539 in male to female diversity nationwide. The undergraduate population is comprised of 1,495 males and 1,792 females. When available, the chart below will include the male to female percentage among Baldwin Wallace College's undergraduate students. The disparity between the counts of men and women at Baldwin Wallace University is lower than the national average. When available, the chart below will include the male to female percentage among Baldwin Wallace College's faculty. The ratio of male to female faculty at Baldwin Wallace College is excellent. To come up with the geographic diversity for each school, we factored in where every student resided before they attended college. About 74.4% of the students attending Baldwin Wallace University come from within Ohio. This places Baldwin Wallace College at the national average and gives it a national geographic diversity ranking of #795. The undergraduate student body is split among 28 states (may include Washington D.C.), as shown in the chart below. There is a small community of about 48 international students at Baldwin Wallace University representing 17 countries. For all the details, go to the Baldwin Wallace College International Student Page. The traditional student is between the ages of 18-21. At Baldwin Wallace University, 65.4% of students are in the age 18 to 21 bracket, compared to the national average of 60%. We rank Baldwin Wallace College #1,737 in the nation for student age diversity. 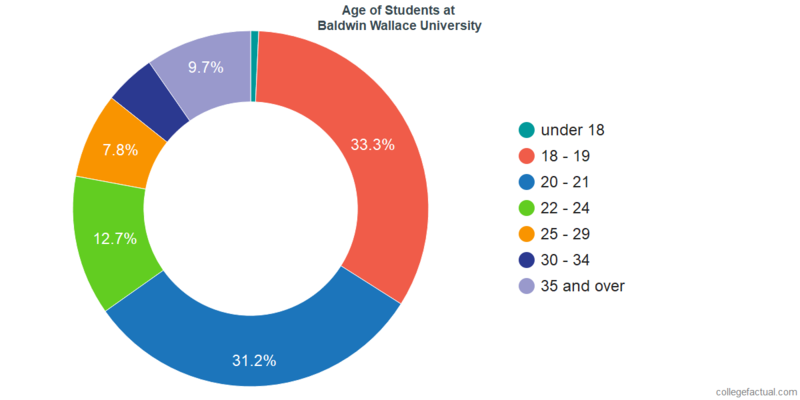 Analyze the age range of Baldwin Wallace College students with the following chart. The root word of diversity is from the Latin, "diversus" which means "various". We use it today to describe an amalgamation of people, traditions, ideas and cultures. Students who state that diversity in school is important to them are looking for institutions to provide a variety of curricular and non-curricular opportunities to learn from and learn with people of different ethnicities, races, ages, abilities, sexual identities, classes, and religions. How is Baldwin Wallace College doing at supporting students from all financial backgrounds? Schools with excellent racial and ethnic diversity still may not be diverse when it comes to other factors, such as income levels. Get a better idea of how Baldwin Wallace College supports low-income students by visiting the Financial Aid Page. Is Diversity Important to Baldwin Wallace College? What are you trying to find in regards to college diversity? Speak to the school to see what kind of support groups and clubs are offered to promote unique perspectives.